Toronto Raptors guard Kyle Lowry lies on the court and celebrates a 3-pointer alongside teammates Greivis Vasquez, left, and Terrence Ross during their game against the Brooklyn Nets on Wednesday night. Wednesday night in the NBA, the Toronto Raptors were up 25 points over the Brooklyn Nets late in the third quarter. According to reasonable models, the Raptors had more than a 99.9 percent chance of winning the game. And they did end up winning the game. But does that mean the game was over in the third quarter, and Raptors head coach Dwane Casey could have called it a day? Does that last 0.0001 percent represent the odds of a meteor hitting the Toronto bench? It doesn’t. Teams and coaches can’t afford to rest on historic odds of winning. Those odds are based on teams behaving in some average way. That average way for NBA coaches is to compete long past a 99 percent chance of winning. Casey showed that Wednesday. Even up 25 in the third, he came out of a timeout with two starters and his best three subs on the floor. It wasn’t the Raptors’ top lineup, but Casey didn’t empty the bench. After ending the third quarter up 22 points (still a greater than 99 percent chance of winning), the Raptors saw the Nets quickly cut the deficit to 11 with a long eight minutes to go. 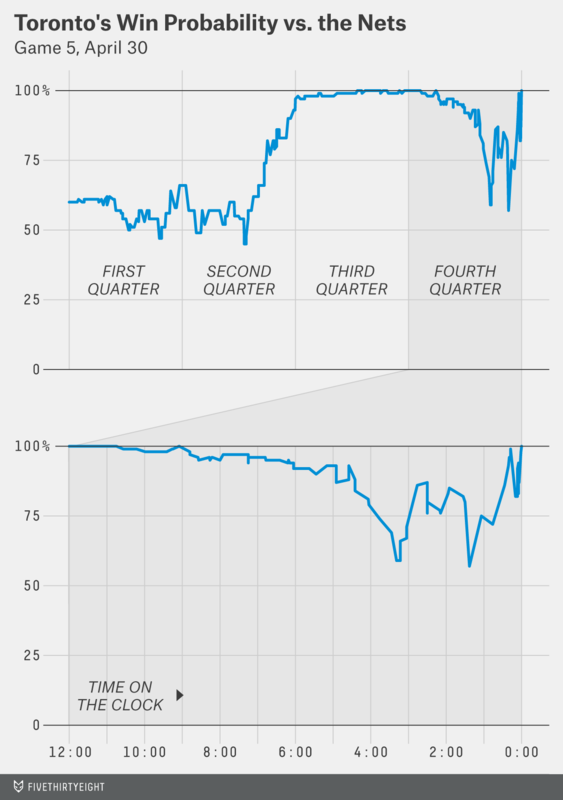 That dropped the Raptors’ chances all the way down to … 97 percent. In most cases, if you tell a fan his team has a 97 percent chance to win, he relaxes and turns the channel (or if he’s a Miami Heat fan, he heads for the parking lot but begs to be let back in after Ray Allen hits a legendary 3-pointer to send Game 6 of the NBA Finals into overtime). Most of the time — about 97 percent, to be exact — heading for the parking lot is a safe move. But only for a fan. Teams and coaches still need to be paranoid until the odds get a lot closer to 100 percent. The same is true with FiveThirtyEight election predictions. In 2012, FiveThirtyEight’s continual projections that President Obama had more than a 70 percent chance of winning reelection didn’t mean that the Democratic campaign or the Democratic electorate could relax. It was probably because the Obama campaign didn’t relax that it continued to maintain its lead and, ultimately, win. Predictions are gambling tools, but they are also — if used properly — management tools. On their own, 97 percent doesn’t help Casey and 70 percent doesn’t help Obama. But knowing the process that went into those odds, and their history and context, can.